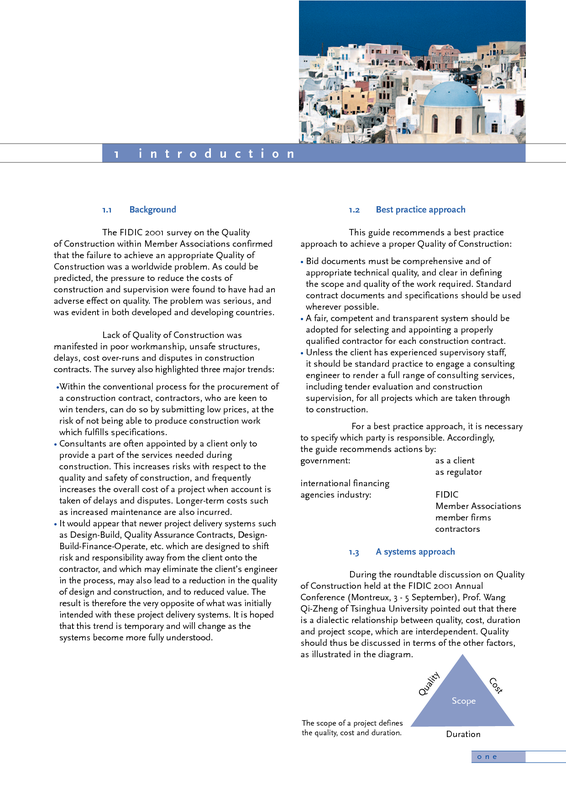 Improving the Quality of Construction - a guide for actions, 2004. Electronic version in encrypted PDF. 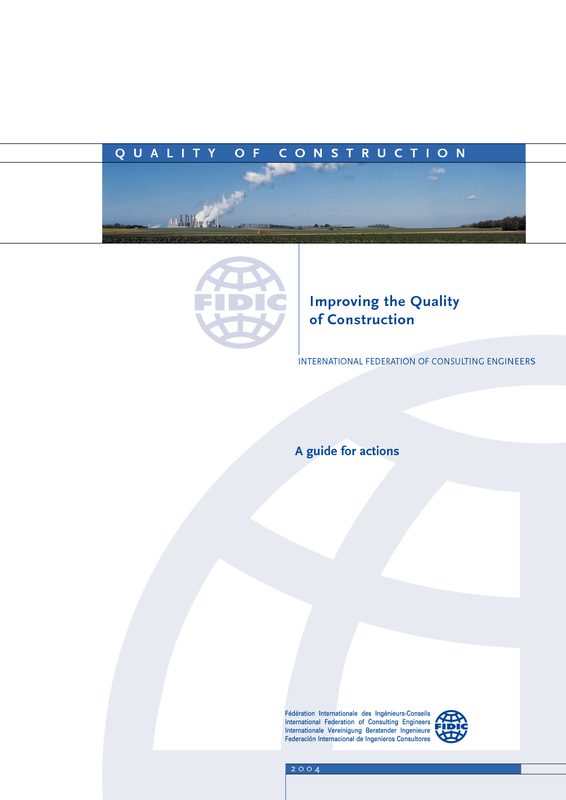 A best-practice approach to help solve a worldwide lack of Quality of Construction calls for action by FIDIC, FIDIC Member Associations, firms and international financing agencies. Quality of Construction or rather, the lack of quality, is increasingly being identified by consulting engineers as a serious issue worldwide. The lack of sustainability and potential health and safety problems in completed projects, an increase in the number of disputes and the failure to provide value for money in completed contracts are obvious outcomes of the lack of Quality of Construction. Accordingly, FIDIC decided to take up the issue by establishing a Quality of Construction Task Force. FIDIC should take a leading role in working with other stakeholders to address the potentially serious problem of decreasing Quality of Construction. The Task Force would verify the extent of the problem by undertaking a survey of FIDIC Member Associations and client organizations. If it was confirmed that a problem existed on a global scale, then appropriate guidelines and policies would be developed, together with other stakeholders. more rigorous selection and pre-qualification processes, linked with closeout assessments, which are obvious strategies. Business Integrity Management Systems to ensure transparency in the selection of contractors. 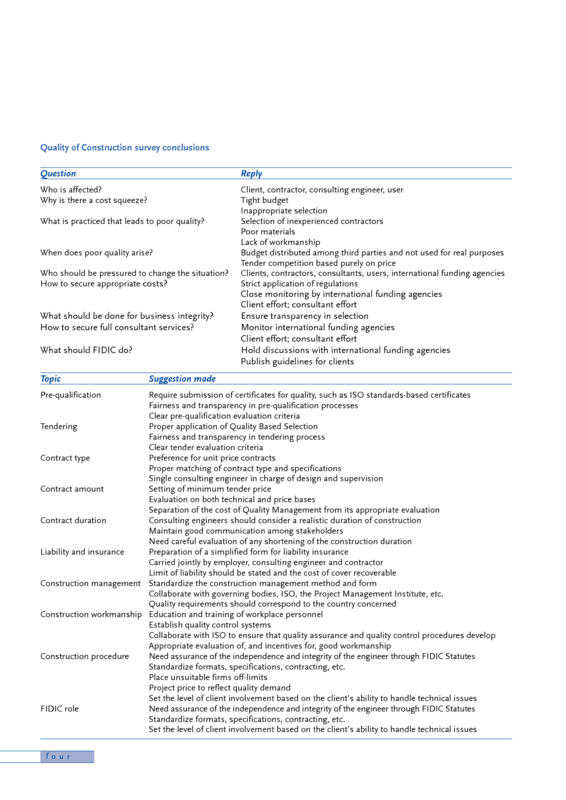 other measures which could be identified as relevant for achieving quality in the construction process. A survey on verifying the extent of the problem within Member Associations and client organizations was conducted by the Task Force during April to June, 2001. The results of the survey, presented at the FIDIC 2001 Annual Conference, confirmed that a problem did in fact exist on a global scale. 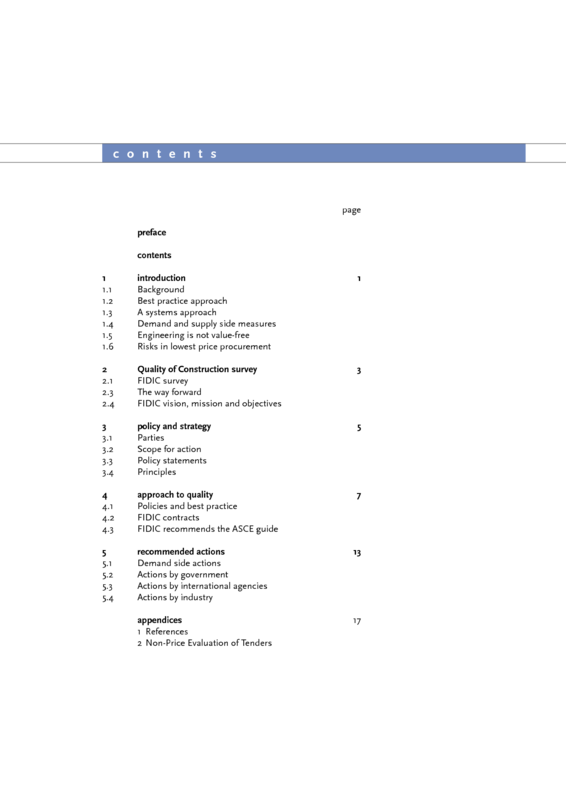 The Task Force subsequently started work on the development of a guide for actions. 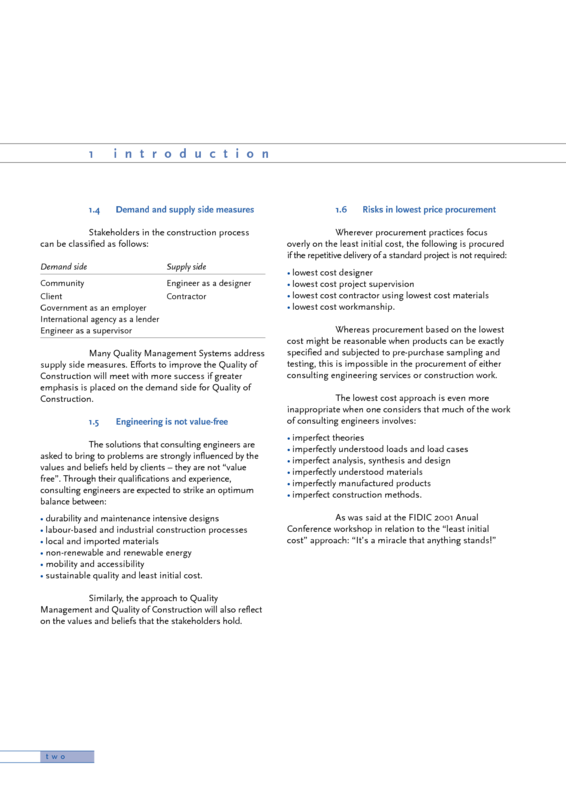 help users understand what is meant by Quality of Construction. 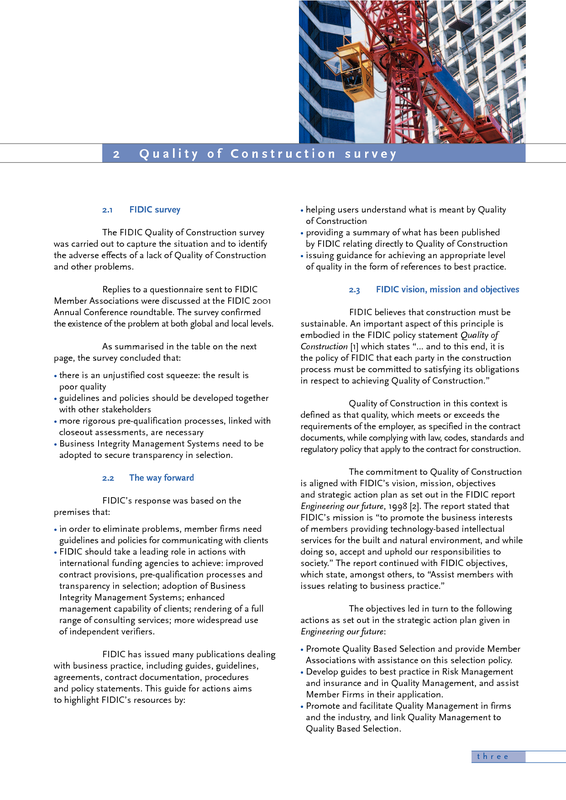 provide a checklist of what has been published by FIDIC relating directly to Quality of Construction. 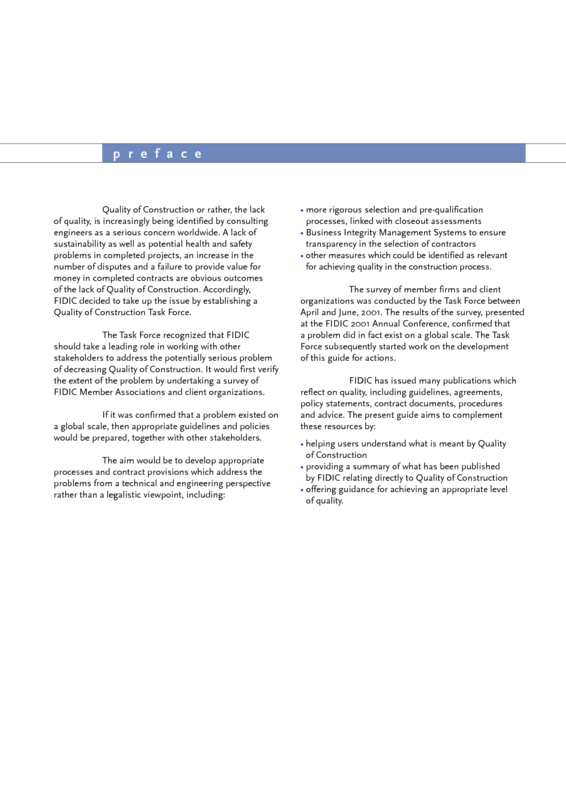 issue guidance by way of references to best practice in achieving an appropriate level of quality. FIDIC believes that construction must be sustainable, and to this end, it is the federation's policy that each party in the construction process must be committed to satisfying its obligations with respect to achieving Quality of Construction. Quality of Construction in this context is defined as that quality, which meets or exceeds the requirements of the employer, as specified in the contract documents, while complying with law, codes, standards and regulatory policy that apply to the contract for construction. "Quality in the constructed project is achieved when the project team works together to fulfill their responsibilities to complete the project objectives in a manner that satisfies the requirements of each participant. The agreement between the owner and design professionals, and the contract between the owner and constructor, are the cornerstones of project quality The process of developing these documents provides a structured forum for participants to express their requirements and align their interests. As a project proceeds, these documents are a key source of understanding for project objectives and the responsibilities of each team member. The level of project quality is directly related to the clarity with which the team members understand and express their requirements."